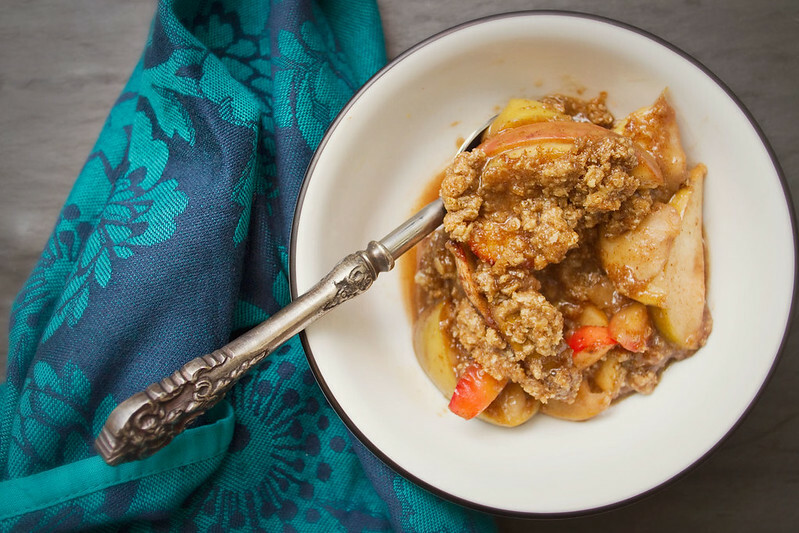 Apple crisp and autumn go together like jack-o-lanterns and candles, a perfect crisp, hot from the oven and filling the room with the smell of cinnamon and apples, is an emblem of autumn to me. 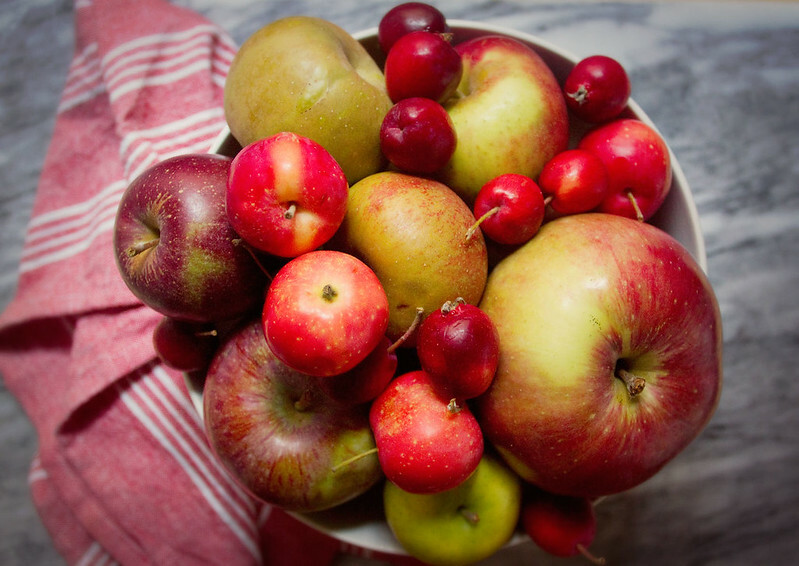 In the fall and winter my mother always made a good deal of apple desserts. 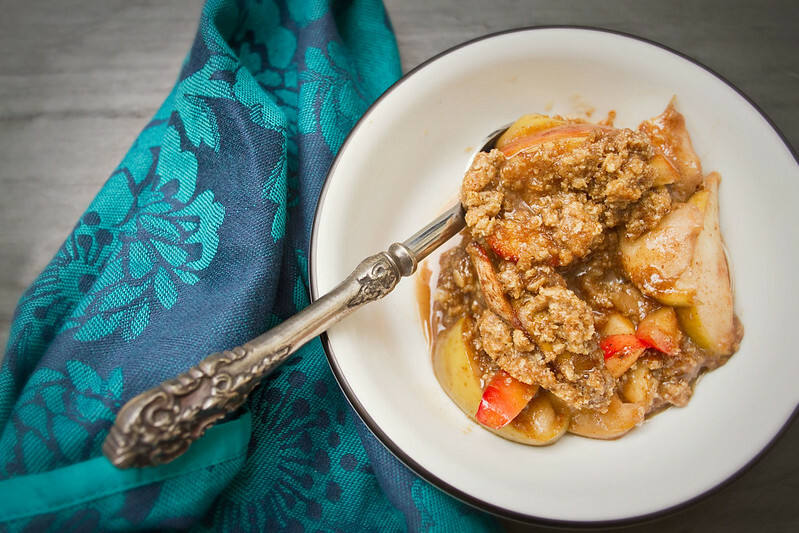 Typically there was apple brown betty, or apple crisp for dessert on the weekends, the soft baked apples swimming in their buttery, cinnamon-y juices, the crisp oatmeal topping sealing all that autumnal goodness inside. The last weekend in September was the first autumn edition of New Amsterdam Market, my all time favorite market. They lost their land this year to the Howard Hughes Corporation, who seem to be on a mission to destroy the whole waterfront scene in FiDi, one cool place at a time. However, the universe smiles on farmers markets, so New Amsterdam has managed to secure their spot for a few more weekends, and my beloved market returns four times this fall. 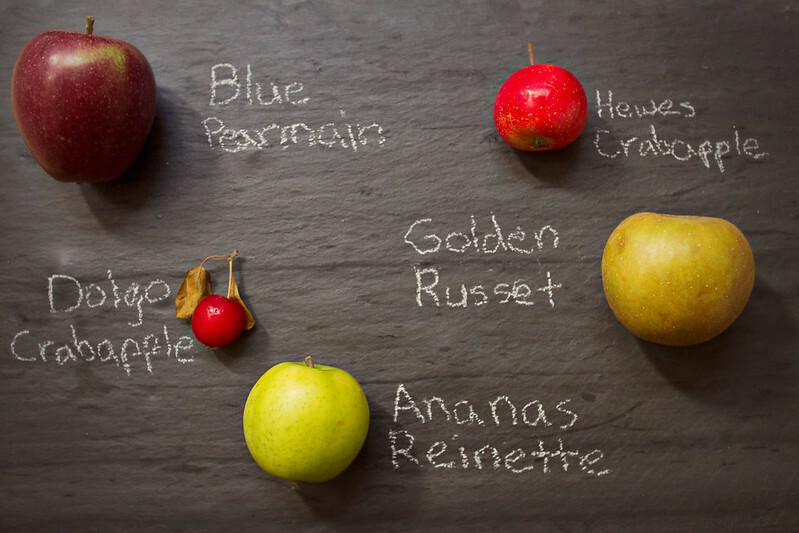 This time my favorite fruitier, Maggie Nesciur of Flying Fox brought a plethora of heirloom apples. I bought about four pounds of them, in a wide range of types, from the tiny, crisp Ananas Reinette that tasted of pineapple, to a massive japanese type that I roasted on a stick while camping this weekend. She even had two varieties of edible crab apple, and she gave me a few handfuls to bring home. I tasted the crab apples at home and found that I loved the teeny-tiny Dolgo, which tasted and looked quite a bit like a raw cranberry, but I found the Hewes to be far too mealy and sweet, and thus all the Hewes found their way into this crisp where they baked up beautifully. 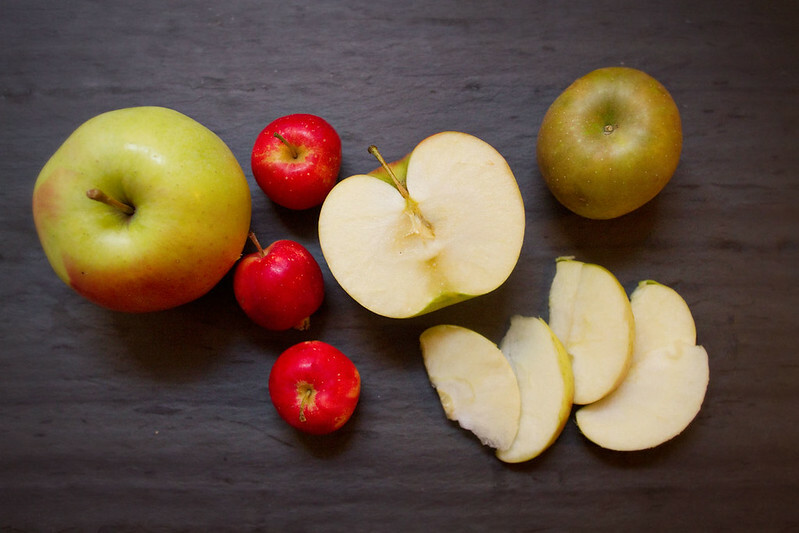 I used a mix of apple types in this crisp, as I usually do when cooking with apples, but I'm sure a type-specific crisp, perhaps using Honeycrisp which are both sweet and tangy, could be delightful. In autumn I love all things spiced- mulled cider, spice cake, gingerbread, baked apples rolled in cinnamon and clove, pork tenderloins stuck full of cloves, spiced mulled wine, etc. So naturally when I set out to turn some of my Flying Fox apples into crisp, I wanted it to be a spiced crisp. However, while rounding up all the spices I would need, I couldn't seem to locate my ground cloves. I knew I had some, but no matter where I looked I could only find my jar of whole cloves. 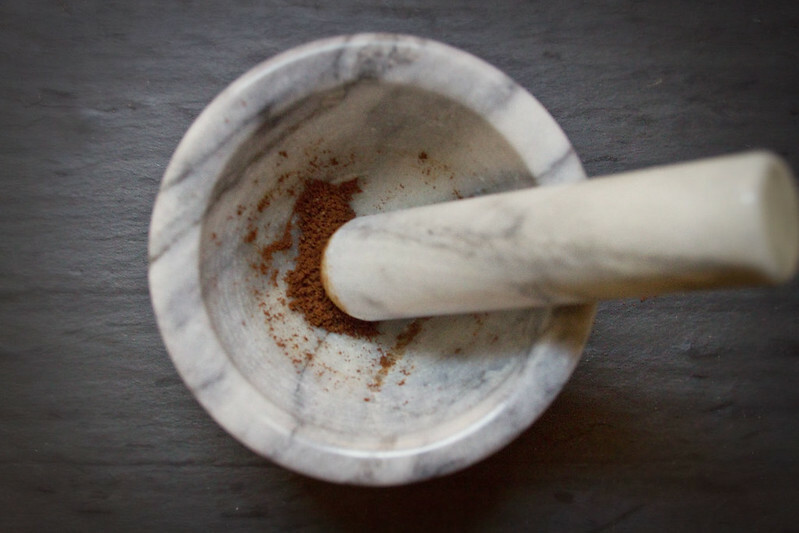 Finally I gave up and took out my pestle and mortar. 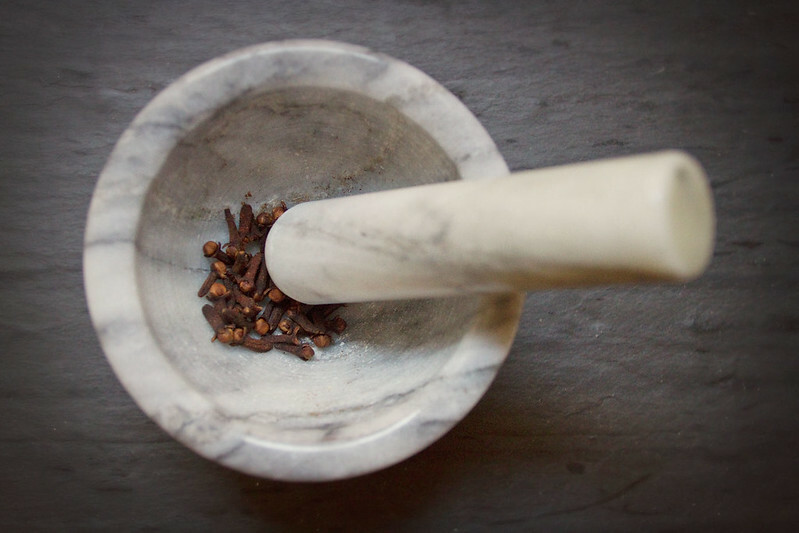 Ten minutes and a sore grinding arm later I had ground cloves. I love using maple syrup as a sweetener in my baked goods, the richness of the maple works well with apples, cinnamon, pumpkin, really most autumnal recipes are better with a bit of maple. I highly recommend you use real maple for this recipe (and always! ), the imitation stuff just doesn't have the same flavor, and I'm not sure how it will bake up. Give the real stuff a try, a little bit goes a surprisingly long way. I think of crisp as the lazy bakers answer to pie. It has the soft, fruity, sweet filling and the carb based crispy top. It's perfect for me, as I am a very lazy baker most days, and never want to roll out a crust if I don't have to. 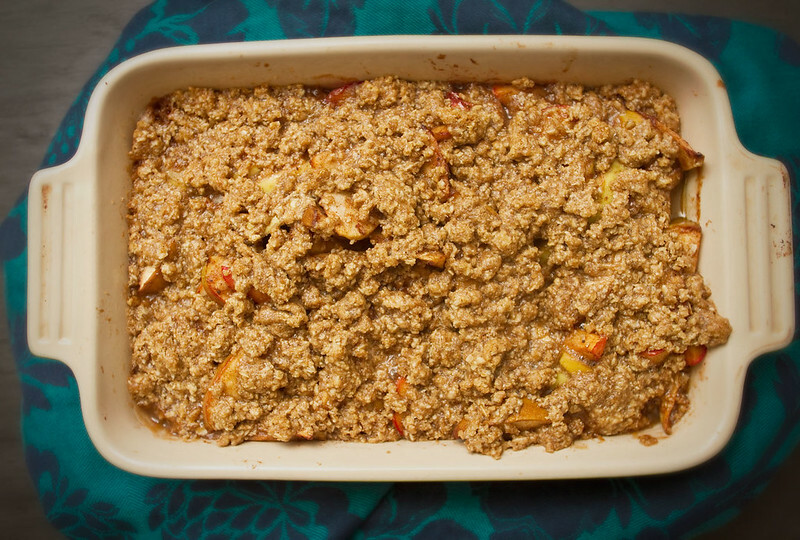 Besides, crisp makes up for it's lack of crust by having a fantastic crumbly topping and a ton of gooey, delicious fruit beneath. Cut the 1/2 C butter into small cubes, then place all topping ingredients in your food processor and pulse until well combined. Alternatively, if you don't have a food processor, or prefer oats that are still in tact, soften the butter cubes a bit then combine all topping ingredients in a bowl and work together with a pastry cutter, two forks, or your fingers. Work until well combined. 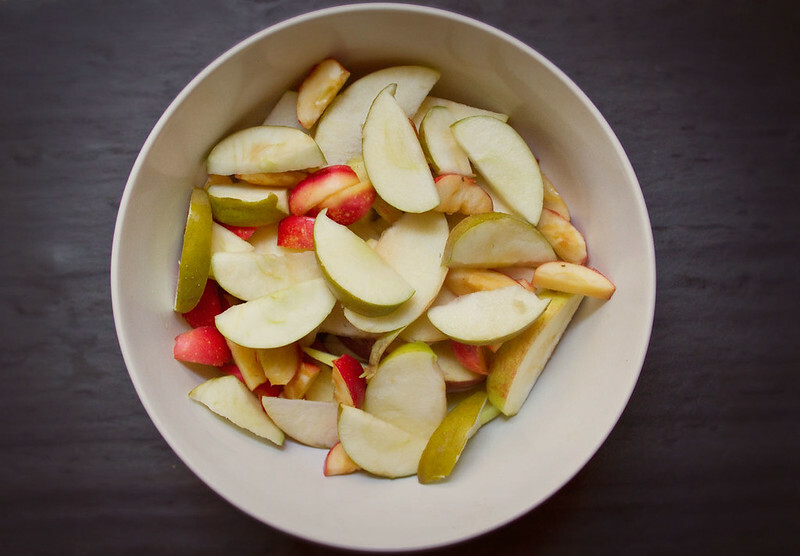 Cut your apples into 1/4-1/3 inch thick slices, place in a large bowl, drizzle with maple syrup, and toss. 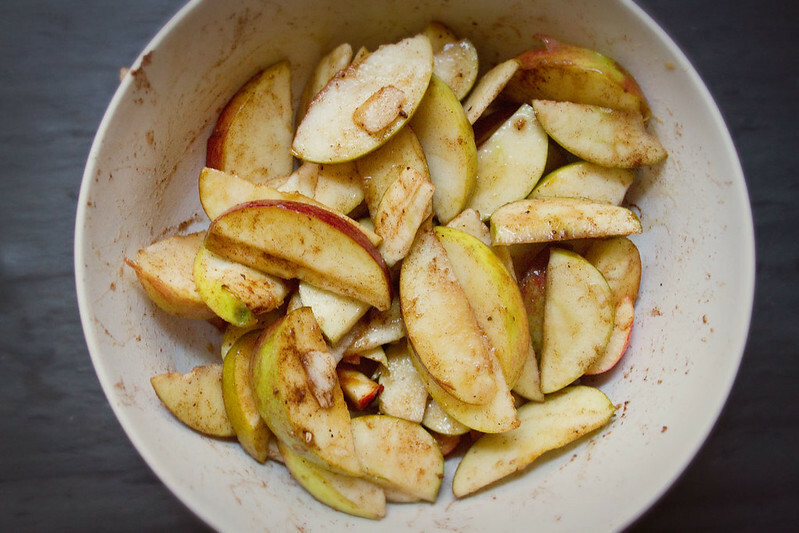 Sprinkle cinnamon, cloves, all spice, and nutmeg over apples and toss again until well coated in spices. Grease a baking dish or pie pan with a bit of butter and add the apples, pour any maple syrup from the bottom of the apple bowl over the top. 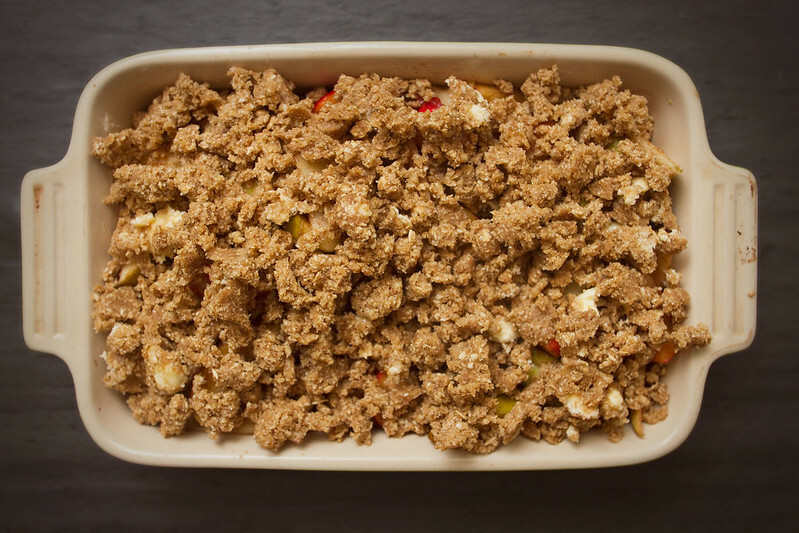 Crumble your topping and distribute it all over the top of the crisp. It doesn't need to be perfectly even, just sprinkle away until you've covered it all and used all the topping. Bake until topping is crispy and browned, about 25-30 minutes. With my heavy stoneware pans it sometimes takes up to 40 minutes.